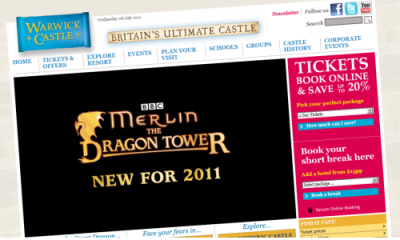 Part of the Merlin Entertainments Group which includes Alton Towers, Chessington World of Adventures and Lego Land to name but a few, the Warwick Castle website development launched in April 2011. Since launch the new Warwick Castle website has proven it's worth, reporting the highest transactional performance improvement within the Group! The website was created in partnership with Warwick Castle's media agency and is built to maximise on cross promotion and up-selling. 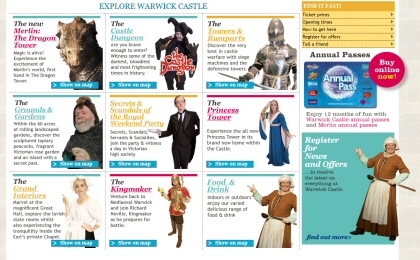 Combining rich media user experiences in the form of animated promotions and games, the site showcases the attractions and events that Warwick Castle provides plus offers many opportunities for cross promotions such as add-on attractions, overnight stays and upgrades in event tickets. There are a raft of ideas in the pipeline for enhancing Warwick Castle's website and we are looking forward to continuing to help them develop it. Email sales@impacttechnology.co.uk Available 9:00 to 17:00 GMT Monday to Friday. Copyright © 2010 - 2019 Impact Technology UK Ltd.